I have a really difficult time nailing that one down. One that has to be in the running is the porterhouse steak because it is actually two steaks in one. On one side of the bone you have what is the New York strip steak - beefy in flavor and it has a slightly denser texture. On the other side you have the tenderloin - delightfully tender and mild tasting. 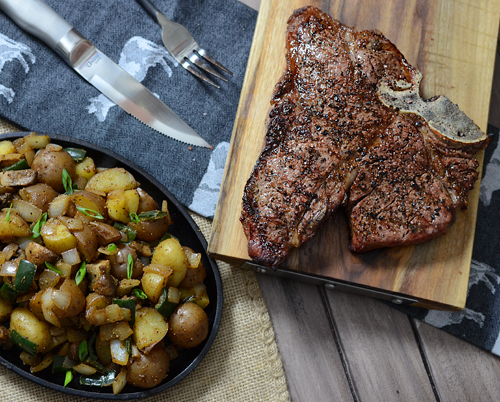 A porterhouse steak (IMPS 1173) and a T-bone (IMPS 1174) look similar, what's the difference? Location and size. The T-bone is trimmed from the front of the loin (towards ribs) while the porterhouse is cut from the rear of the loin. Because of this the porterhouse will have larger portions of the filet and strip compared to a T-bone. I'm not sure if it's a standard or not, but the general rule of thumb is that if the filet is 1.5 inches wide or more, it's a porterhouse and if it is less, it's a T-bone. Picking a porterhouse at the store is pretty much the same as other steaks. Look for steaks that are at least 1 1/2 inches thick, have deep red coloring and fine marbling throughout. 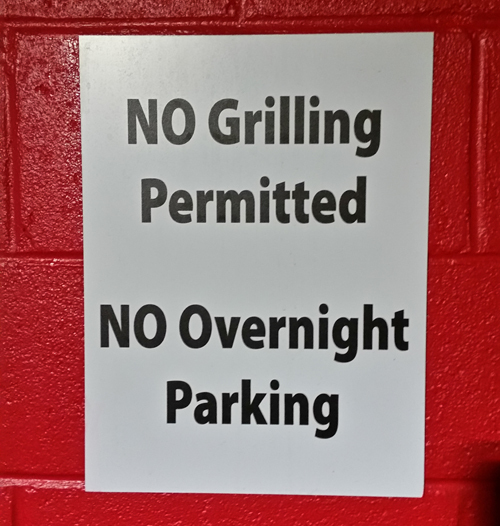 Of course, pick the one with the bigger portions of strip and tenderloin. 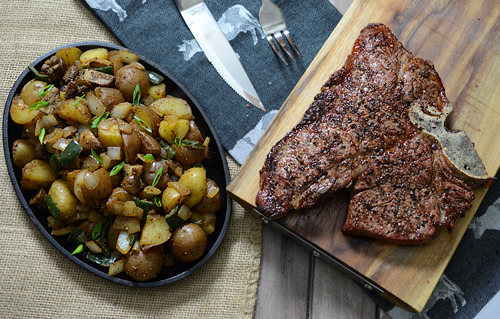 Because it's really TWO steaks, the porterhouse is a great one to share. Many top steakhouses, like Luger's, serve the porterhouse on a large platter with the strip and filet already sliced, ready for sharing. 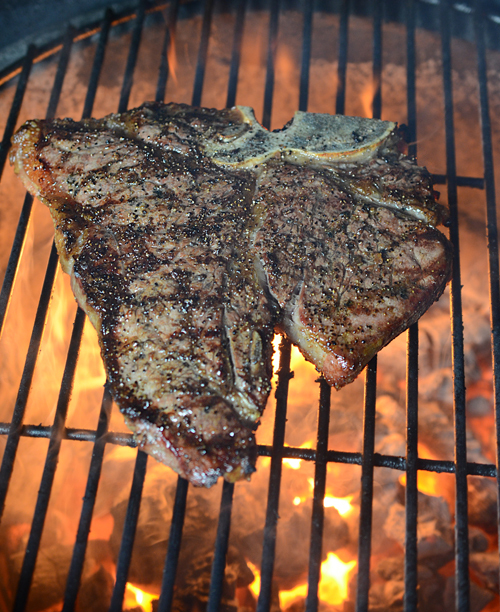 Here's a porterhouse that Alexis and I shared for New Year's Day. 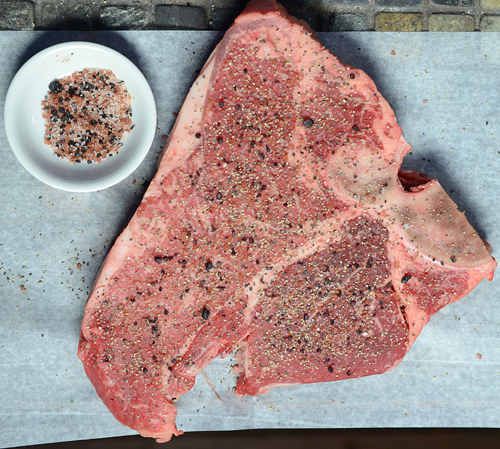 The steak is seasoned simply with quality salt and pepper so it can shine on it's own merits. The hash is a bold flavored departure from the boring baked potato. 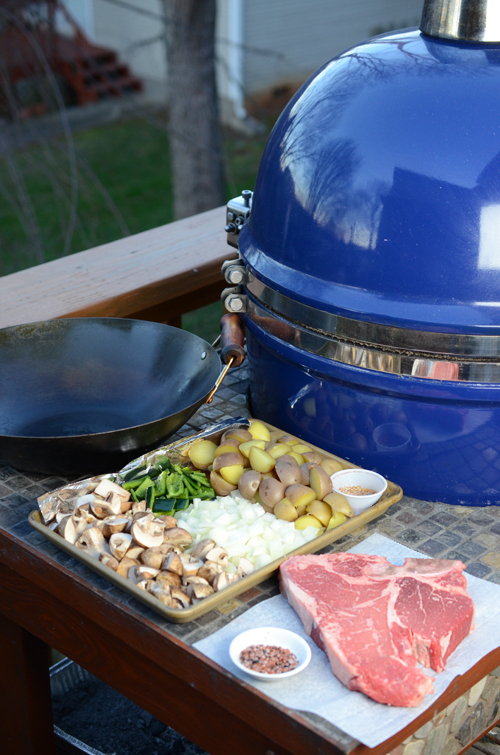 We cooked this on our Grill Dome Infinity Series kamado grill so I cook the veggies first since the cooking temps will rise. If I did this on a kettle grill I'd probably cook the steak first while the fire is it's hottest and then cook the hash as temps trail off a bit. On a gas grill you could do it either way since it's easy to raise or lower cooking temps. Set up your grill for direct heat and preheat to 350°f. Preheat your skillet and then add oil once it is hot. Wait until the oil begins to shimmer, about 1 minute. Add the mushrooms and poblano chile and cook, tossing occasionally, 4 minutes. 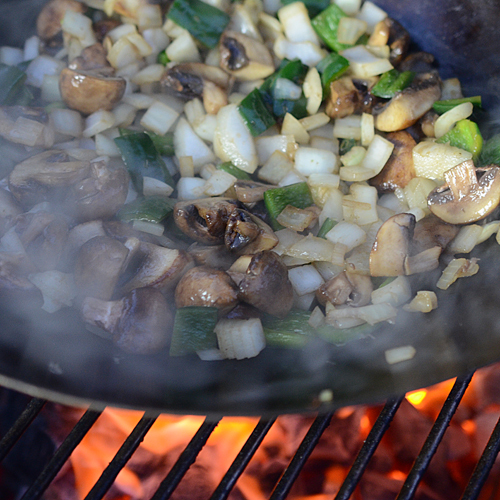 Keep the grill lid closed as much as possible to keep the fire under control. Add the onions and cook until tender, tossing occasionally, about 6 minutes. Add the potatoes, salt, pepper, chili powder, ancho chile (if using), granulated garlic, and cumin. Cook, tossing occasionally until the potatoes are cooked through, about 2 more minutes. 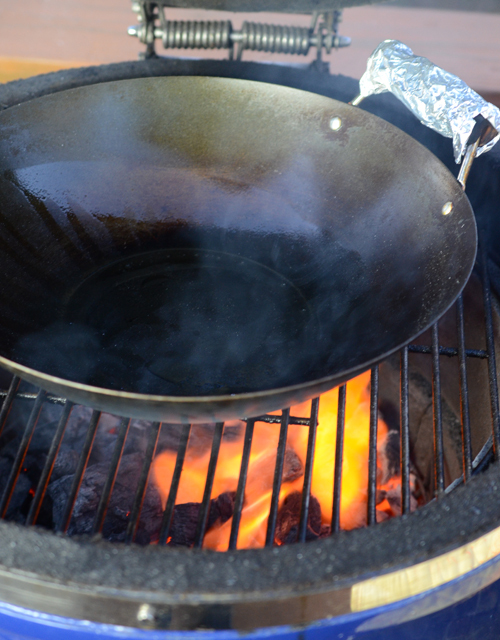 Remove the wok, cover with lid or foil to keep warm. Raise the temperature of your grill to 500-550°f. Season the steak with black pepper and salt to taste. Grill until the internal temperature reaches an internal temperature of about 127°F for medium rare, about 4 1/2 minutes per side. Remove and serve with the poblano hash. If you have wood handles on your wok, cover them in foil. Mine are over 6 years old and have gotten darker but have not burned yet. Double handles fit inside the kamado grill as opposed to the long straight handle mine has. 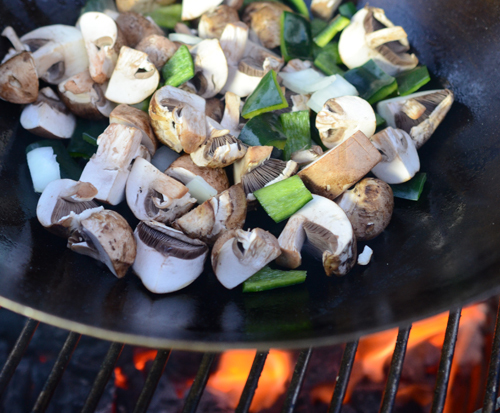 When you stir fry, saute, or other high temp cooking methods using a pan on the kamado grill, your cooking temperatures will rise from the frequent influx of air from opening the lid. My basic strategy is 1) start off at a lower cooking temperature, 2) keep the bottom vent closed down as much as possible when the lid is open (watch for back flash), and 3) work quickly. 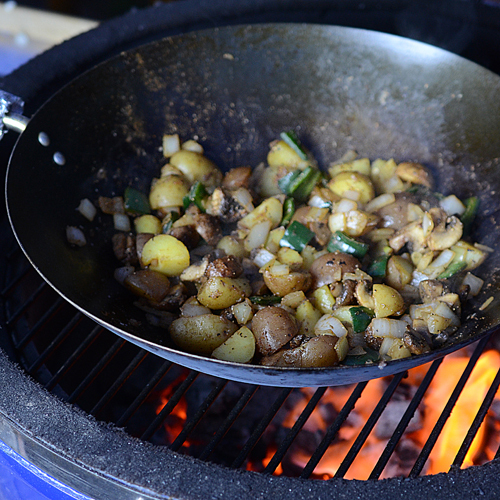 You can also use a cast iron pan, a grill topper, or any other grill safe cooking vessel. I just like using a wok most of the time because of personal preference. By the time you are done with the hash, your grill should be pretty close to the 500-550°f that you want for grilling the steak. Strip steak is on the left side and the roundish part on the right is your beef tenderloin. 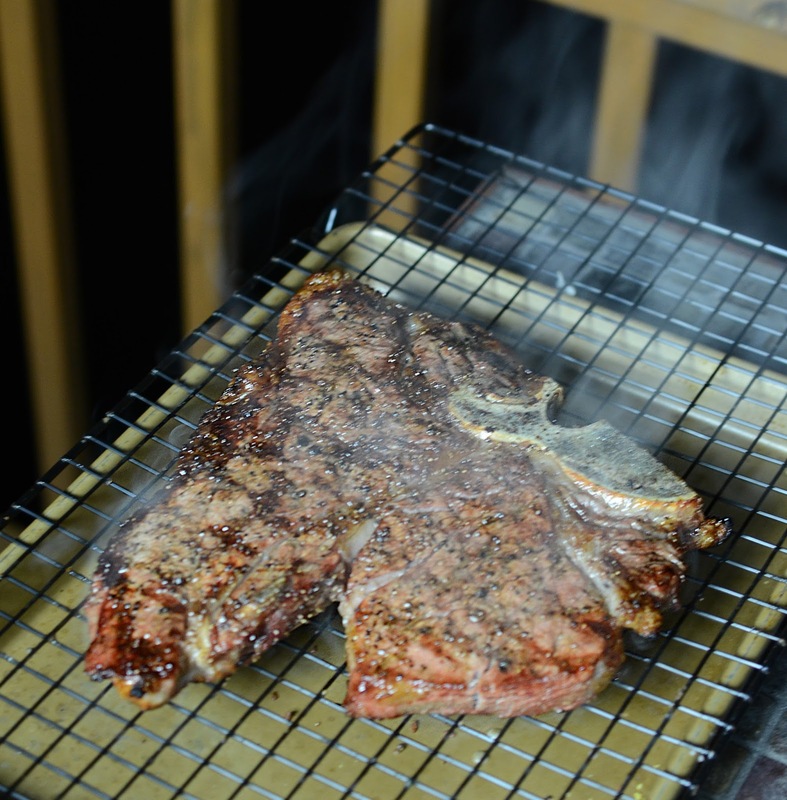 On a T-bone that part will not be as wide and often is more triangular shaped instead of round. When you do basics like just salt and pepper, quality is especially important. 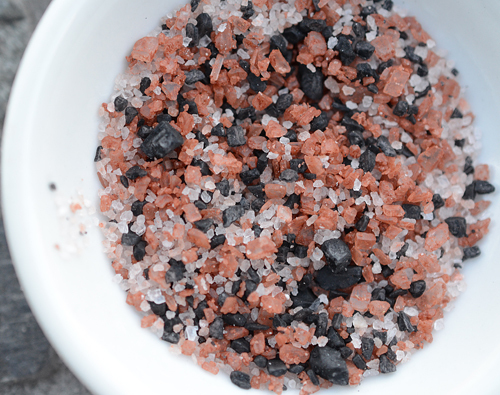 I used a blend of Himalayan pink salt, Hawaiian red clay sea salt, and Hawaiian black sea salt from Galena Garlic. As always, cook times and temps will depend on a myriad of factors. But in general, I like 4ish minutes per side at 500-550°f for medium rare. Of course I go by touch and checking internal temperature with my trusty Thermopen. I hit it with just a little more of the finer Himalayan salt as it rested and the flavor was off the charts. 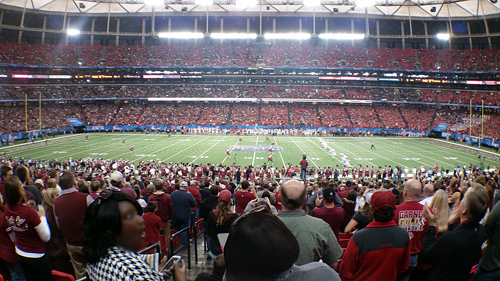 Chick-fil-A - "I never slaw such a thing"
Trevor and I went to the Chick-fil-A Peach Bowl for the FSU-Houston game on New Year's Eve. Well aren't you Ms Sally Killjoy? 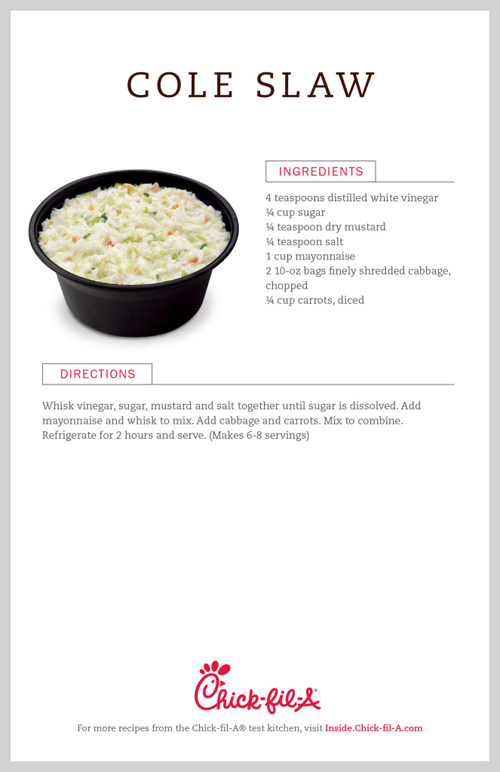 That very day, Chick-fil-A had some good news and bad news for fans of their coleslaw. The bad news is that they are taking slaw off of their menu as of 01/18/2016 to make room for lighter fare. The good news is that they are releasing their slaw recipe before pulling it from their line up. 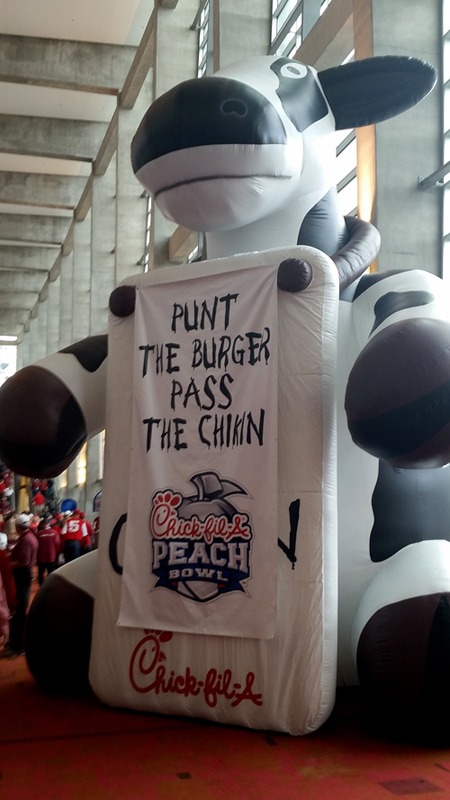 Here's the recipe courtesy of Chick-fil-A. [FTC Disclaimer] Grill Dome is our official kamado sponsor. We have no affiliation with Chick-fil-A, Galenta Garlic, or any other brand mentioned.